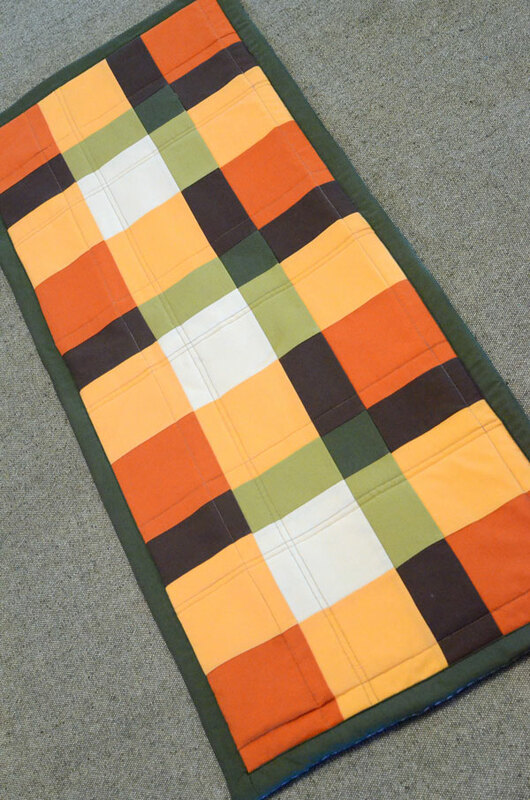 Table Runner Hot Pad: Perfect for holidays and family gatherings! 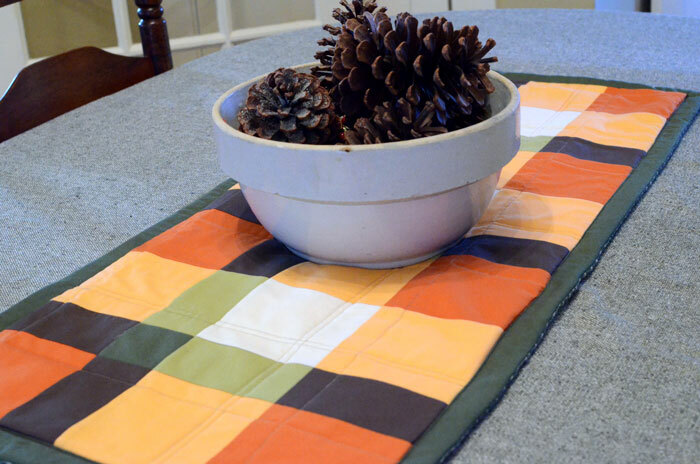 This Table Runner Hot Pad is perfect for holidays and family gatherings! Take the heat off of your table while still looking cute . . . win-win! I think every family has at least one Thanksgiving must-serve dish, one dish that “it’s just not Thanksgiving” without. My mother’s Thanksgiving must-serve list has about twenty dishes on it, and it doesn’t matter if there 5 people around the table or 20, it’s “just not Thanksgiving” if those dishes aren’t on the table. No joking, one year we had 4 pies for 6 people. That averages out to ¾ a pie FOR EACH PERSON, and that’s after eating the full Thanksgiving meal. That was also the year the table was so full of food that we had to put the basket of rolls on the floor. All those dishes take up a lot of space on the table. And each dish that’s served warm will need a trivet or hot pad underneath it. A full Thanksgiving meal takes a lot of hot pads. We often end up just using folded up kitchen towels. This table runner solves that problem! Besides just being a pretty accent for your dining table, it’s also a really long hot pad. 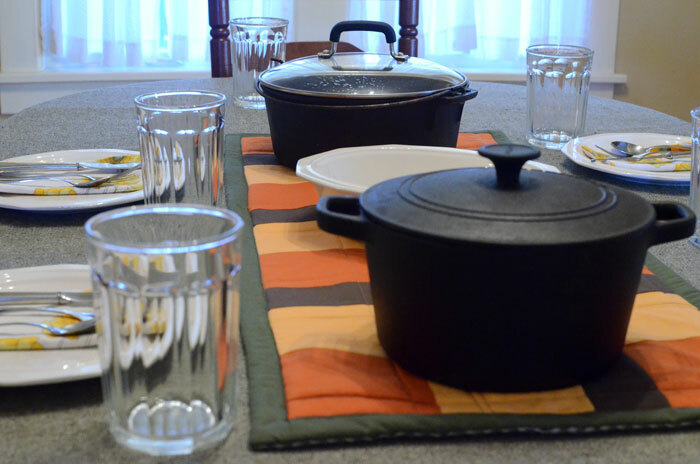 You can place warm dishes up and down the whole table runner. It simplifies arranging a table and also serving up everyone’s plates. Read on for the tutorial! Plaid is super popular right now, so I thought it would be fun to create a plaid design for my table runner. Plus, the plaid gives a warm, traditional feel. But making the design oversized and piecing it from solids gives it a modern twist. I used a deep orange and olive green color scheme that is perfect for fall and Thanksgiving. I think it will be beautiful on my mother’s Thanksgiving table this year. To make it in the orange/green/cream color scheme like I made, you’ll need a dark and a light orange, a dark and a light green, a cream, and a dark brown (preferably with a little bit of a greenish tint to it). With those colors, you can piece the patchwork design you see below. You can usually find a good selection of solids at your local quilt shop. Like I said before, you’ll need a dark and a light each of orange and green, plus a cream and a dark greenish brown to use in the spots where the green and orange stripes intersect. That can be a little overwhelming – I know I was a bit overwhelmed at first – but here’s what I did to pull the perfect colors for my plaid. First, I grabbed a dark shade of green that was pleasing to me. Then, I found a lighter shade of it. Then I found a dark orange that I liked, and a lighter shade of that color. Next up, a warm cream. To test out my colors to see if they worked well together, I stacked the bolts from light to dark – starting with the cream, then the light shade, then the dark shade. If the colors made a natural progression, then I was good. But if one of the shades didn’t seem quite right, I could switch out with another shade to see if it was a better fit. Once I had the orange and green shades that worked, it was pretty easy to find a brown that would work with both the orange and green. Like before, I stacked the bolts – this time the dark orange, the brown, then the dark green – to check that my shades made a natural progression. So now that you’ve chosen your solids, it’s time to gather your other materials and cut your fabrics. Unless otherwise stated, all seam allowances are ¼”. RST = Right Sides Together. Sew the pieces RST, one after another, to create4 patchwork rows. Each row is made of 10 pieces, each sewn in a different repeating pattern. Row 1 is made from dark orange, brown, and light orange, sewn in that order. Row 2 is made from brown, dark green, and light green, sewn in that order. Row 3 is made from light orange, light green, and cream, sewn in that order. Row 4 is the same pattern as Row 1. 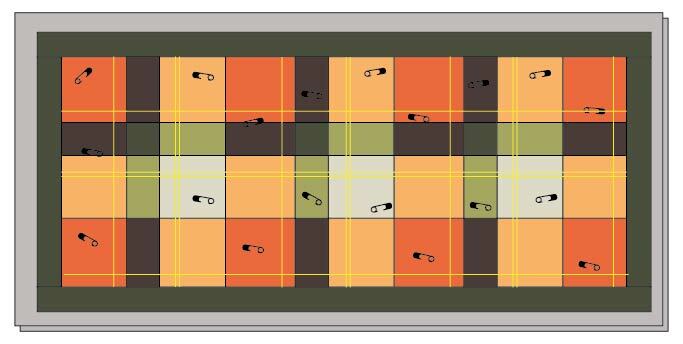 Now, sew those rows together to make a patchwork plaid design. Sew Row 2 to the bottom of Row 1, RST and matching your corners as best as possible. Press seam open. It should look like this. Now, sew Row 3 to the bottom of Row 2 in the same way. And finally, sew Row 4 to the bottom of Row 3. Look at your patchwork plaid! Isn’t it pretty? 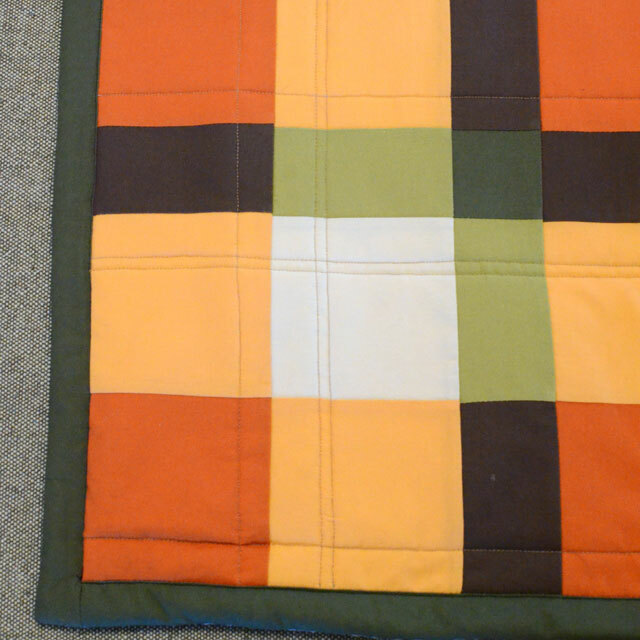 The patchwork plaid design is framed in a dark green fabric. Let’s add that frame now. First, sew the 1.75” x 14.5” green pieces to the short sides of your patchwork piece, RST. Press seam open. It should look like this. Now, sew the 1.75” x 37.5” strips to the top and bottom of your patchwork piece. Before we start the quilting, I’ll just tell you that I am only the most casual of quilters. So if you’re a “real” quilter you may cringe at some of my finishing techniques. For example, I quilt the design BEFORE adding the backing. That’s not how you usually make a quilt, but it allows you to quilt without worrying about getting puckers on the back at intersecting lines. Mark a line 1” from the start of each column/row that has the white squares. Mark another line ¼” from the lines you just marked. (Marked lines are shown in yellow). Then, mark a line ¾” from the end of each column/row that has the orange squares. Place the Insul-Bright on a large surface. Place the cotton batting on top of it. Finally, place your patchwork piece on top of that. Smooth out any wrinkles. The Insul-Bright and batting layers will be slightly larger than the patchwork layer. That allows for the fabric to shift a little as you quilt your design. Use safety pins to “baste” your layers together. Be careful when you pin that you don’t have any wrinkles or puckers in your layers. I put safety pins every 5” or so. Take your quilt “sandwich” to your machine and stitch all those lines you marked. Use a walking foot if you have one for your machine. It will help keep the layers from shifting as you sew. When you’re done, trim the Insul-Bright and batting even with the edges of your patchwork layer. You’re almost done… I promise! Place the backing fabric on top of your patchwork piece, RST. Sew around all four sides with ½” seam allowance, leaving 4” or so open to turn it. Turn right side out through the hole. Clip corners, push corners out gently, and press. Stitch in the ditch between the green “frame” and the plaid patchwork. You’re finished with your table runner! !